Kansai Plascon - Packaging Design Consultants. Moag Bailie. Clean, constructive design instantly identifies usage and function of the refocused WoodCare range, aligning closely with consumer needs, encouraging order in a highly confusing and competitive retail environment. Clear colour code differentiation harnesses the familiar and augments durability while simple, effective iconography provides product insight and enhances stand-out shelf appeal. 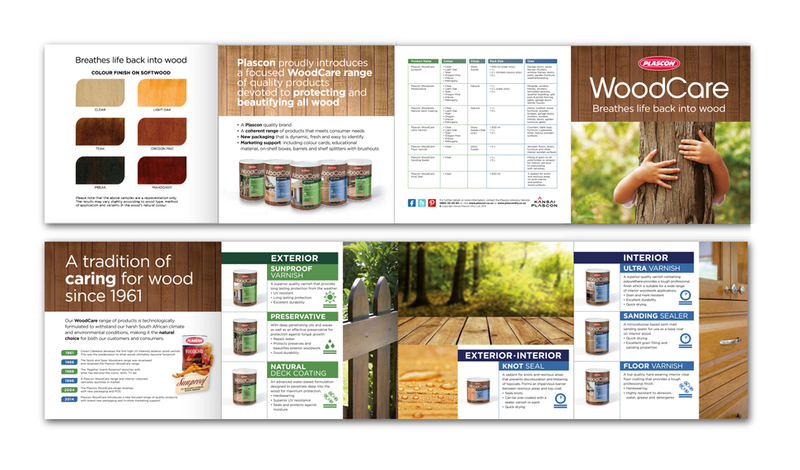 Clean, intuitive brochure design instantly identifies usage and function of the refocused WoodCare range, aligning closely with consumer needs while clear colour sampling methodology encourages order and instils confidence in a highly confusing environment.